The Open Microscopy Environment (OME) is a multi-site collaborative effort among academic laboratories and a number of commercial entities, that produces open tools to support data management for biological light microscopy. Designed to interact with existing commercial software, all OME formats and software are free, and all OME source code is available under the GNU General public license or through commercial license from Glencoe Software. 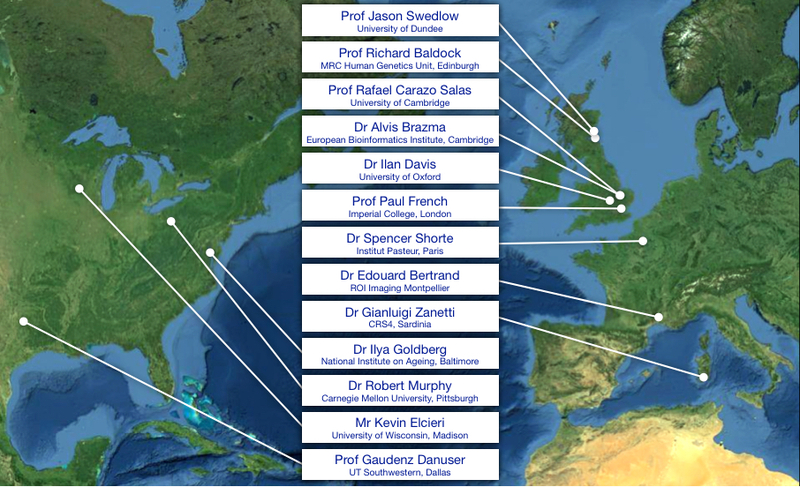 In 2011 the OME consortium was awarded a Wellcome Trust Strategic Award (Ref: 095931). This Award provided support for the continued development of the OME Data Model, Bio-Formats file translation library and OMERO application in Dundee, as well as funding development positions in nine other laboratories. In 2014, this Strategic Award was extended into 2015. OME's work on extensions of metadata during 2016/2016 are funded by the BBSRC (BB/L024233/1 and BB/G022585/1). The development of the Image Data Resource (IDR) was funded by the BBSRC from 2015-2016 (BB/M018423/1) with continuing funding from two EU Horizon 2020 awards, CORBEL) (Ref: 654248) and Euro-BioImaging Preparatory Phase II (Ref: 688945). OME also participates in two other H2020 projects-- Global BioImaging (Ref: 653493) and MULTMOT (Ref: 634107). OME's work on Bio-Formats is supported by a Wellcome Trust Biomedical Resource Award (Ref: 202908). Build a dedicated support team for the OME community with funding and resources to deliver help with installation and development of applications within the UK scientific community. The idea of catalysing development with OME’s resources at specific locations is not exclusive. The OME Consortium and Wellcome Trust funding are committed to using this expansion as a catalytic event. We aim to use these as the first of many development sites, which are using OME’s tools. In fact this is already the case. Bitplane’s Imaris (www.bitplane.com) links to Fiji and Bio-Formats. We are collecting names and contacts of sites that are using and/or developing OME’s resources. If you like to be added to this list please contact Wilma Woudenberg w.woudenberg@dundee.ac.uk.